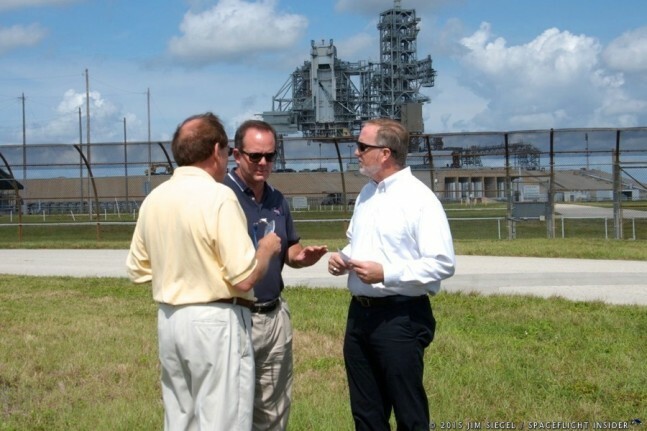 KENNEDY SPACE CENTER, Fla — Mic Woltman of NASA’s Launch Vehicle Services Engineering revealed on Monday, April 13, at a press briefing outside Launch Complex 39A that a number of additional launch pads are being considered as part of NASA’s “KSC Master Plan”. The earlier Master Plan, which dates back to 1967, identified two launch pads designated as C and D, to be located North of Pad B. Because of the proximity to Pad B, Pads C and D will be combined into a single major vertical launch pad. Another major launch pad is also being considered for the area between Pad A to the north, and Pad 41 located on the property of the Cape Canaveral Air Force Station. A third, smaller launch site is being considered as an adjunct to Pad B, presumably one that would utilize some of Pad B’s support facilities. In answer to a separate question, Woltman confirmed, “We are working with the state of Florida on an environmental impact study” for a potential launch pad to be located in the Shiloh area some miles north of Pad B. The state of Florida is reportedly interested in purchasing this parcel for the construction of a launch pad to be operated by the state, not NASA. I keep hearing; KSC is wanting to do this and that, but it seems to be all talk and no action. I’ve ben hearing about the Shiloh thing for years and still, all talk and no action. It seems the environmental study is the road block to everything. Right now, more jobs and getting the US back to flying our own astronauts should be the priority. No doubt Jesse ! ! I too believe the environmental movement is all about shutting down Jobs for the space coast. Many company’s have tried to come and set up shop at Kennedy, and NASA puts up so many road blocks, they eventually give up and go elsewhere. There are still many more corporations who are trying but have been given the runaround by NASA and the USAF. So what is Bill Nelson and Gov. Scott doing about it besides blowing hot air. They say they’re all about jobs, I hear a lot of talk, but no action.